So I recently had the opportunity to hear His Holiness the 14th Dalai Lama speak. Not only was it a once-in-a-lifetime experience, I don’t think I can really even express how excited I was to be in the same SPACE as this preeminent religious figure. The fact that I’m taking Buddhism just happened to be icing on the cake. The arena was packed. There had been tickets reserved for students and faculty, doled out by lottery, and the rest were sold to the public and those who had not gotten one in the drawings. Yeah, those tickets were sold out 16 minutes after the online box office opened. 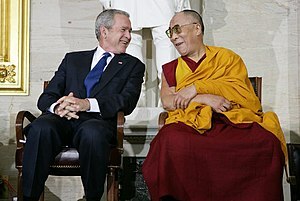 His Holiness’s general topics were compassion, no-self (or how there is no inherent “you-ness” or eternal soul that makes you different from anyone else), the inherent goodness of people, etc. For some parts of it, he was difficult to understand due to his accent, and sometimes was at a loss for words, which is when his translator stepped in and provided the proper one. To be honest, the content of his speech wasn’t groundbreaking. It was sort of Buddhism 101 for the first 40 minutes or so. But then the Q&A section after his main speech concluded was more enlightening, touching on topics such as terrorism and his interactions with world leaders, how to deal with personal anxiety, and the religious implications of technological advances. I’m not going to go into real detail, because there’s no point in rehashing the man’s speech, just rest assured that he had some interesting things to say. But you know what really struck me about him? How profoundly cheerful he seemed. His laugh was utterly infectious; every time he burst into a round of old-man “Hehehe” chuckles, the arena exploded into laughter with him. He was in harmony with the forces around him, with his knowledge of his place in the universe, and in his ability to help those around him, if only they would have the heart to listen. His speech was off-the-cuff, nothing written down, he just spoke from his past and from his heart. It made for an organic and personal listening experience. When asked about how to deal with the mundane disappointments of everyday life he reminded us that he lost his freedom as a teen and lost his country in his mid-twenties. It was quite chastening, as it reminded us that our position as privileged college students should not be taken for granted. He told us that optimism was the key to getting through life, no matter what struggles you’re going through. Stay positive, even in the face of failure or disappointment. I guess being bffls with George “Chuckles” Bush doesn’t hurt either.